“The oils in CYPRESS SkinCare are 100% organic and cold pressed. They are pure, potent goodness delivered by nature. We keep the ingredients true to their natural state by never overheating. Body Love is a light yet powerful oil that moisturizes the skin without feeling greasy. 100% Organic, Cold-pressed Coconut Oil, Sweet Almond, Jojoba, and Olive Oil blend together to give you some serious hydration! It absorbs into the skin quickly and leaves a subtle sheen, perfect for showing off your legs and skin this summer! Body Love has only the slightest scent of coconut oil and lemon essential oil, and it’s absolutely delicious! The ultimate test was to massage this oil into my dry feet, throw some socks on, and see how it moisturized. I’m happy to report that it made my feet much softer and smoother after just one use! I usually use cream cleansers to gently clean my dry, sensitive skin, so I was curious to try the Pure Love Cleanser. It is a blend of 100% Organic Hemp, Jojoba, Castor Oil, and Lemon Essential Oil. I’m happy to report that this oil cleanser quickly melted away my foundation, concealer, and eye makeup. My face was left completely clean, without a trace of makeup left behind. My face felt hydrated and soothed after massaging off this cleanser with a warm washcloth. After using this, my face had a nice glow with noticeably less redness. I could have even gotten away with not using a moisturizer afterward, but I didn’t want to get the skincare gods all riled up, so I did anyway. Face Love is a lightweight beauty oil that leaves your face moisturized and radiant. The ingredients include 100% Organic Almond, Cold-Pressed Coconut, Hemp, and Jojoba with Cypress Essential Oil. I used Face Love after washing my face and before applying my foundation, which made it glide on and blend much easier (ugh, don’t you just hate it when your foundation gets patchy looking because of your dry skin?). I only needed 1-2 pumps of this product to cover my face and neck. It made my skin feel and look soft, healthy and happy! Cypress SkinCare makes pure, good-for-your-skin oils that do any excellent job hydrating, cleansing, and nourishing your skin. Of course, the products are all vegan and cruelty-free, YAY! 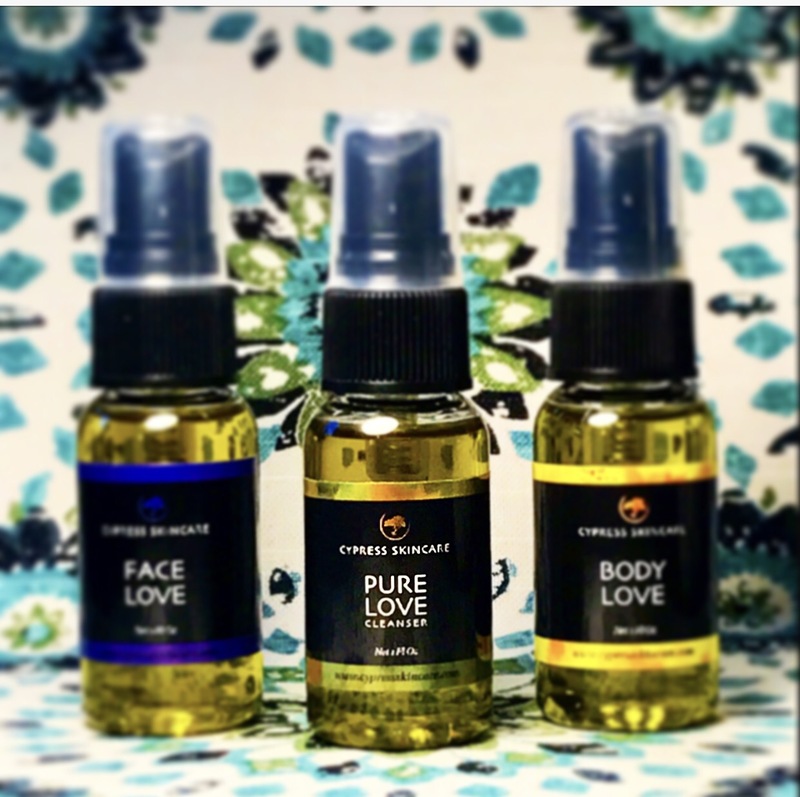 The Pure Love Cleanser and Face Love oil work wonderfully together, and Body Love is an excellent, all-natural body moisturizer. I highly recommend giving these products a try! Thank you, CYPRESS SkinCare for sending me these products to review!